You liked Shaun of the Dead? Then Hot Fuzz will bust a cap in your arse. Matt Nettheim Hot Fuzz has a blast with the buddy-cop genre. For all the huzzahs deservedly heaped upon 2004's Shaun of the Dead, in which it took a good long while to discern the living from the walking deceased, the zombie-flick spoof was little more than an extended sketch taken, oh, nineteen minutes beyond its breaking point. But the movie, created by director Edgar Wright and star Simon Pegg, provided such a bloody good time that its acolytes and admirers  those weaned on George Romero gorefests and the Pegg- and Wright-penned slacker Britcom Spaced, chiefly  didn't mind that it dragged its undead feet a little too long. Fact is, those who watched Dead on DVD found myriad deleted sequences and outtakes, among them a prolonged gag involving Coldplay, as worthy of savoring as the feature itself. So, yeah, Shaun of the Dead was too long. And not nearly long enough. The same can be said of Hot Fuzz, wherein Wright and Pegg refashion the American buddy-cop genre in their own deadpan image. At a running time of more than two hours, it's a wee bit lengthy; the thing's damned near epic. And yet to see it once is to fall in love and want to pay up immediately for another screening, so abundant are the poker-faced gags that race through the quaint village of Sandford in which the would-be-wannabe Bay-'n'-Bruckheimerian blockbuster is set. 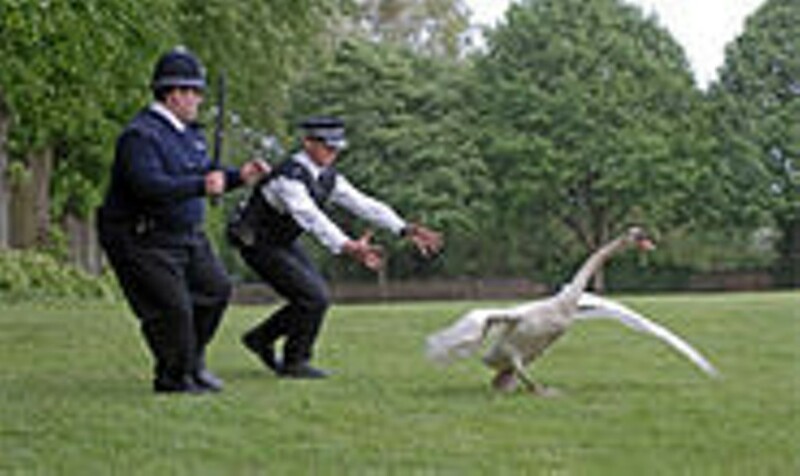 Hot Fuzz is a cult film writ humongous  a send-up of Hollywood spectacles that's far bigger and better than anything to which it pays homage. Yes, Wright and Pegg have built their film on the foundations of others  nearly 200, by their estimation, ranging from The Wicker Man (the low-key original, not its garish redo) to the oeuvre of Chuck Norris to Wright fave Freebie and the Bean to, finally, Lethal Weapon, Bad Boys II and Point Break, the trinity that inspires Fuzz's overwrought gunplay and homophobic homoeroticism, which, come to think of it, are the same things. The tributes extend even to the casting of Hot Fuzz, in which Edward Woodward (of both The Wicker Man and The Equalizer) stars as the surly head of the Sandford Neighborhood Watch Association, former James Bond Timothy Dalton appears as a slick supermarket manager, and Paul Freeman (The Long Good Friday, Raiders of the Lost Ark) shows up as a reverend with ungodly secrets hidden beneath his frock. There is even a Moulin Rouge dig, shortly after Jim Broadbent turns up as the kindly police chief who knows plenty about Sandford's skeletons. Pegg, looking years older than 37, plays Nicholas Angel, who, we are told during a rapid-fire intro narrated by Martin Freeman, is the best cop on the London police force, trained in everything from hand-to-hand combat to chess. He's so good, in fact, that his supervisors  played, in bit roles, by Freeman, Bill Nighy and Steve Coogan  transfer him to the idyllic Sandford (Wright's actual hometown of Wells), lest Nicholas keep shaming his inept colleagues. Sandford, where tavern owners serve pints to underage younglings to keep them from roaming the streets, has but one major concern: how to once more win the Village of the Year contest. But things, of course, aren't what they seem in Sandford, and the movie crawls toward a combustible finale that references every cop movie Wright's ever seen; indeed, it often feels like the movie exists solely to reference a pivotal scene from Point Break, in which Keanu Reeves fires his gun into the air in a fit of impotent rage. That scene in particular is a favorite of Danny Butterman (Nick Frost), the town drunk and police officer with whom Nicholas is partnered. Danny's been waiting his whole life for someone like Nicholas  a proper cop who's been stabbed and shot at a few times and who seemingly lives the life of his cinematic idols. Ultimately, Hot Fuzz is a kind of a love story between these two guys  appropriate, as the film is obviously inspired by the scene from Lethal Weapon in which Mel Gibson begs Danny Glover to put his gun in Gibson's mouth. But Hot Fuzz, like Oasis on its first two brilliant albums, transcends its influences to create a brilliant Brand New Thing  a laconic laff-riot. It's not tethered to its roots, nor constrained by its tributes to lesser things. (That was always the problem with Airplane!, which doesn't hold up as well as you think it does.) It thrives as its own entity, a British variation on Hollywood nonsense, and as such it's a little gloomier, a little coarser and a lot more cerebral  oh, and funnier than all the Reno 911! boxed sets combined. For all the huzzahs deservedly heaped upon 2004's Shaun of the Dead, in which it took a good long while to discern the living from the walking deceased, the zombie-flick spoof was little more than an extended sketch taken, oh, nineteen minutes beyond its breaking point. But the movie, created by director Edgar Wright and star Simon Pegg, provided such a bloody good time that its acolytes and admirers  those weaned on George Romero gorefests and the Pegg- and Wright-penned slacker Britcom Spaced, chiefly  didn't mind that it dragged its undead feet a little too long. Fact is, those who watched Dead on DVD found myriad deleted sequences and outtakes, among them a prolonged gag involving Coldplay, as worthy of savoring as the feature itself. So, yeah, Shaun of the Dead was too long. And not nearly long enough. Ultimately, Hot Fuzz is a kind of a love story between these two guys  appropriate, as the film is obviously inspired by the scene from Lethal Weapon in which Mel Gibson begs Danny Glover to put his gun in Gibson's mouth. But Hot Fuzz, like Oasis on its first two brilliant albums, transcends its influences to create a brilliant Brand New Thing  a laconic laff-riot. It's not tethered to its roots, nor constrained by its tributes to lesser things. (That was always the problem with Airplane!, which doesn't hold up as well as you think it does.) It thrives as its own entity, a British variation on Hollywood nonsense, and as such it's a little gloomier, a little coarser and a lot more cerebral  oh, and funnier than all the Reno 911! boxed sets combined.